Many media outlets cite the official unemployment rate — the Bureau of Labor Statistics’ U-3 unemployment rate — when reporting on the recovery in the jobs market. This rate stood at 5.0 percent in December 2007 (the first month of the recession) and rose to a high of 10.0 percent in October 2009; it has since fallen to 4.5 percent with the latest numbers. Relative to its peak, the unemployment rate has made up all of the ground lost between December 2007 and October 2009. However, there are good reasons to think that the unemployment rate overstates the degree of recovery in the job market. This series of five measures provide insights on employment and unemployment that aren’t captured by the official unemployment rate. 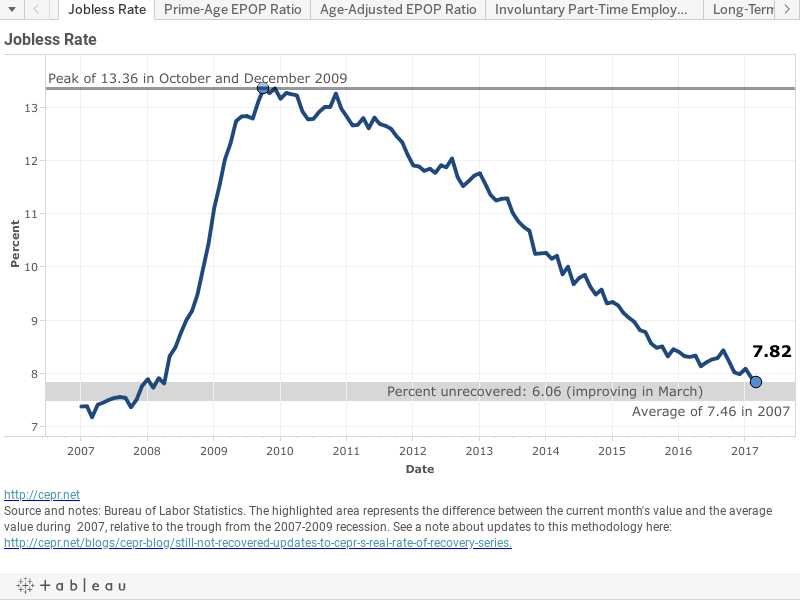 all five measures improved (Age-Adjusted EPOP Ratio, Prime-Age EPOP Ratio, Long-Term Unemployment Rate, Jobless Rate, Involuntary Part-Time Employment Rate). The five measures are charted below. For more analysis of the recently released jobs report from the Bureau of Labor Statistics, see CEPR's Jobs Flash and Jobs Byte. Please note that the methodology for this series has been updated as of April 2016. The jobless rate takes account of all Americans who say they would like a job, regardless of whether they are classified as "unemployed" or not. The age-adjusted EPOP ratio measures the percentage of Americans that would be employed if the age distribution of the population hadn’t changed since December of 2007. Involuntary part-time employment, as a percentage of total employment, shows the percentage of Americans who work part-time for economic reasons but who would like to work full-time. Long-term unemployment, as a percentage of total unemployment, shows the share of unemployed Americans who have been out-of-work for 27 weeks or more.